Date : Issued between 2 BC and 4 AD. Size : 18.0 x 19.5 mm. Weight : 3.83 grams. Grade : gF with a nearly full obverse inscriptions. Reverse : Gaius and Lucius standing forward with spears and shields between them, a simpula and lituus above, and C L CAESARES AVGVSTI F COS DESIG PRINC IVVENT around (the last part of the inscription is off the flan). 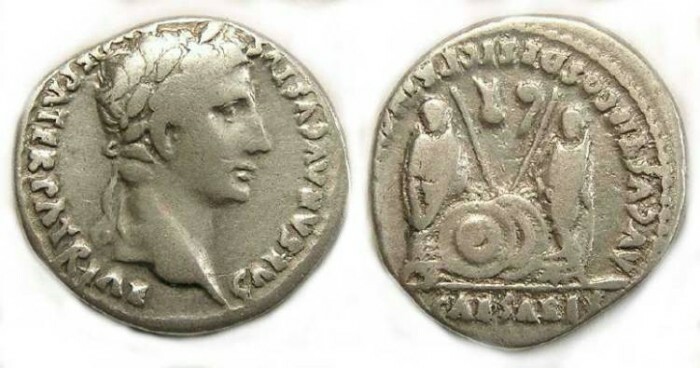 This type commemorates Gaius and Lucius as Augustus' heirs. However they pre-deceased him, and never became Emperors. This type is rarely seen with the entire inscription on flan.